You are here: Home / All Articles / Collector Shares a V.B. Treasure!! 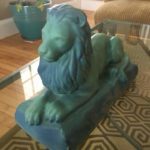 Stanley Goff recently posted on facebook, photos of a very handsome LION statue, in what appears to be the Van Briggle turquoise glaze. That post set the Van Briggle facebook group on fire!! Stanley obtained the piece several years ago from an Ohio antique mall. The piece is 10″ x 4″ x 6.75″ height. The base is filled with plaster. He is interested in learning if any collectors have seen this piece. At this point; he wonders if it was produced as a statue, or if this is one of a pair of bookends. 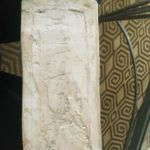 The owner cannot find a Double-A mark on the piece; but it could easily have been located inside the base, which is now filled with plaster. 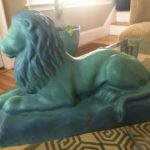 I know that every Van Briggle collector wishes they could find one of these handsome lion statues. Please send an email to me at khonea77@aol.com or post on Van Briggle Show Tell site on facebook if you have any information!